I am so excited I got such a huge response from you guys about Keto and that some of you are doing it with me and some of you are just interested in learning more! The reason we started doing the keto diet is because last year my husband signed up for a half-marathon in hope to become more healthy and actually ended up losing a lot of weight along the way by eating this way. After having our 3rd baby, and wanting to be as supportive as possible, we started eating this way and was so surprised by how we felt! During the holidays we kind of fell off the wagon and decided it was time to get back into it. I don’t mind cooking but with 3 kids, I need easy recipes, but I also don’t want to cut back on flavor because I love food! And that’s exactly why I’m compiling this list of my favorite tried and true recipes here. We have had all of them, and a lot of them I make regularly. Before we get to the recipes, let me just explain what the keto diet is for those of you that may not be familiar. I am not a nutritionist or doctor of any kind, nor am I trained in any way on what keto is. I just have researched the diet and have kind of converted it to our lifestyle and what works for us. There are several types of the keto diet, including lazy (don’t count calories or macros), strict (counting calories, macros etc) and dirty (not necessarily clean eating, processed foods are eaten on dirty keto). I would say we are a mix of lazy and dirty kept, as we don’t count anything and just try to focus on the overall concept of keto – low carb and low to no sugar. Keto is basically a way of retraining your body to burn your own fat for survival, versus burning carbs and sugar for energy. If you take out the carbs and sugar from your diet and eat more fats, you’re body can go into a state called ketosis. Ketosis is a metabolic state where ketone bodies are raised and your body burns the ketones instead of carbohydrates and sugar. To get your body into a state of ketosis, you want your food intake to be mostly (healthy) fats, then protein, then carbs. It’s super important to drink tons of water on this diet as well as under the supervision of your doctor. My husband tries to stay under 30g of carbs per day, and I try to stay under 50g since I am still nursing. We limit sugar to maybe a once a week treat and try to eliminate it as much as possible. You have to be aware of food labels, because there are hidden sugars in so many things! 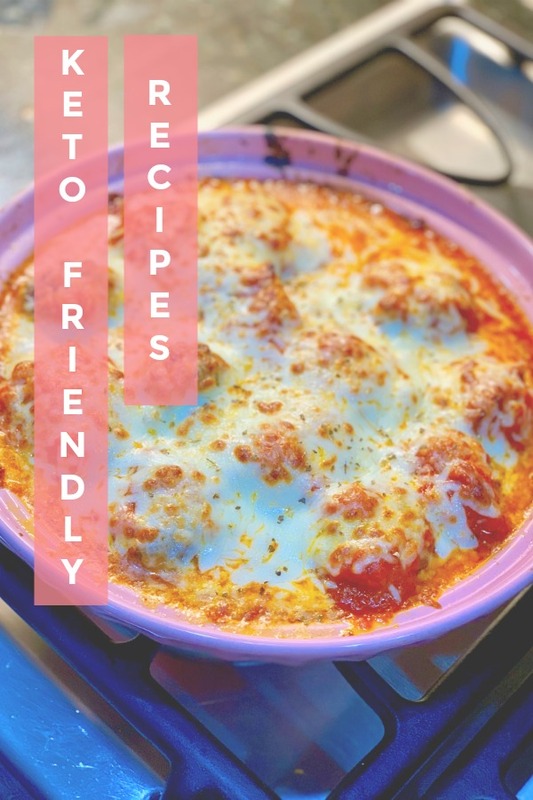 I actually have found a lot of different recipes that are not actually keto recipes, but I was able to adjust enough to be keto friendly. LOADED CAULIFLOWER BAKE – I have to say, this sounds disgusting, I seriously hate cauliflower! But, my mother in law made this for us for dinner over Christmas (thanks Jan!) and I was shocked at how good it was. If she didn’t tell me it was cauliflower, I would have just thought it was broccoli which I can tolerate if it’s covered in cheese! Definitely a must try. BANANA CREAM MOUSSE – Had to include a dessert of course, and this one is my go to! It’s insanely easy and you don’t have to wait for it to set. Make sure the pudding you get is sugar free (keep an eye on the carbs per serving) and use a full fat whipping cream. Its sooo good! PARMESAN MAYO CHICKEN – This is one of my husbands favorites. It super easy too and you likely have everything on hand. All you need is chicken, mayo and parmesan cheese! I think the recipe calls for a side of rice, which I obviously leave out. CRUSTLESS TACO PIE – Another house favorite! If you like Mexican food and no hassle recipes this one is for you! You brown ground beef and then mix everything into a bowl and bake! Sometimes I leave out the salsa if we don’t have it on hand! CHEESY MEATBALL SKILLET – Easy and this one is QUICK! You don’t have to brown ground beef before, the whole recipe is cooked under a broiler. There are breadcrumbs in this recipe, so I don’t use a whole lot of them to keep the carb count down. I also substitute the jarred sauce for Rao’s marina because it’s low sugar! CHEESY RANCH BURGER BITES – Can you tell we love cheese over here? and this here is exactly why I chose Keto over Whole30 – gimme all the cheese! I realize this recipe has philo dough, which I replaced with Mission low carb tortillas. They taste like a real flour tortilla, and I use about 1/8 of a taco sized one for these and it works really well and gives you the “carb” comfort you’re looking for! TACO RANCH BITES – This one is super similar, just an different flavor profile! I use the same low-carb tortillas here. 4 INGREDIENT PESTO BAKE – So fresh and delish! CITRUS SHRIMP AND AVOCADO SALAD – If you’re looking for a light and fresh lunch or dinner this one is super good and easy! Other quick and easy go to’s! We love using tuna pouches and adding things like relish or may to them! Eat it alone or on lettuce, or with a low-carb tortilla. Atkins Bars and Treats – So many of these are delicious and I often have these for breakfast! Other: Almond Butter (if you can ground your own its so much better,) berries, scrambled eggs, Jimmy Johns Unwhich-es, grilled nuggets from Chic fil A. There ya have it!! All my quick and easy go to’s! I highly advise you do your own research on Keto before starting this diet because it can be dangerous if not done properly, or if you have any health issues. Make sure your doctor knows about your change in diet and approves that it’s right for you! Previous Post Snow Day in VA!